I had the opportunity to work with the production team while filming "Struggles Within", a short film which took an emotional look at one young woman’s struggle with depression, and her choice as to whether she wanted to live or die. Almost the entire film is told through dance. Dance is something I am passionate about. I have been dancing since I was four years old. I have danced competitively at Studio Dance Pointe in St. Thomas for most of my dance career. I am well-versed in styles of dance such as contemporary, lyrical, ballet, improvisation, tap, jazz, acro, and hip hop. I have had experience in teaching and assistant teaching dance classes of young dancers. My many years of experience has given me the opportunity to work with multiple well established choreographers. 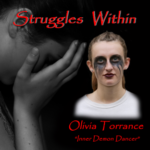 For "Struggles Within" it gave me an opportunity to use my years of experience and skills of dance and choreographer to be a part of the production on two levels. I was the choreographer of the one segment called “Conflict” in the production. I came up with the steps and moves of the segment and worked with the film’s director and producers to take the moves of the segment and transform it into working with the filming of it for the short film. Actor/dancer in movie "Struggles Within"
Being part of the film was an interesting experience and gave me a chance to expand my horizons in dance. I also had the opportunity to work with many of my friends and fellow dancers from Studio Dance Pointe on a dance project that combined our passion for dance and taking on exploring the very important social issue of mental illness and depression. While working on the film I also got to make new friends as well as mentor some of the younger dancers. The film was a wonderful learning and teaching opportunity for everyone. Being part of this talented team allowed everyone to develop new skills and was enriching for all those involved.